Season 14 is a 4 DVD disc set with 20 half-hour episodes. The exercise band is a natural latex rubber band, 6 inches wide and 4 feet long, used by physical therapists and fitness professionals. 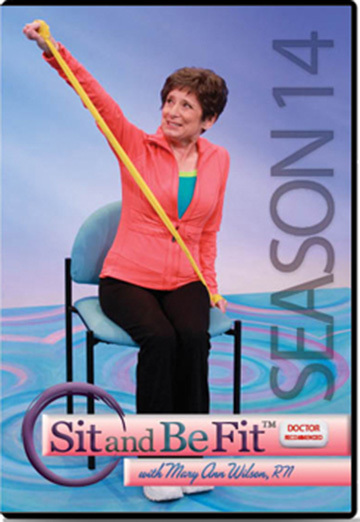 The Sit and Be Fit Season 14 DVD Box Set contains all 20 half-hour episodes in HD from the Sit and Be Fit 1400 Series. Each 27 minute episode includes a full-body workout designed to strengthen, stretch and improve overall functioning of the body, These programs are upbeat and lively, featuring a variety of fun movements and music. Seated versions of the standing exercises are demonstrate by Mary Ann’s daughter Gretchen. Exercise band is included. #1401 All Systems Go! : This program incorporates exercises for the brain along with exercises challenging the vestibular and lymphatic systems, helping to improve balance. #1402 Fit From Head to Toe: A variety of exercises are introduced in this program focused on improving balance and gait. #1403 Sensory Awareness and Breathing: Mary Ann uses fun music to demonstrate breathing techniques and sensory awareness. #1404 Fun with the Large Ball: In this episode the large ball is used in many ways to help strengthen postural alignment and improve balance, flexibility and functional fitness. #1405 Footwork and Core: We take our feet and core muscles for granted. In this episode Mary Ann uses a variety of new exercises to focus on the importance of healthy feet. #1406 Controlled Breathing: Mary Ann experiments with several ways to control breathing to efficiently distribute oxygen throughout the body. #1407 Vestibular and Core: This episode features a nice mix of vestibular and core work. Gretchen shares gait training exercises during the standing portion of the workout. #1408 Posture: Mary Ann breaks down techniques to improve posture and special guest Jeff Brooks shares a take-home exercise to help improve balance. #1409 Breathing: Mary Ann offers several techniques to develop healthy breathing habits. #1410 Back Health: Mary Ann introduces new exercises to gently loosen the thoracic spine with subtle shoulder and back movements. #1411 Functional Fitness: This episode includes exercises designed to help you perform activities of daily living with ease and without injury. Registered dietitian, Janell Buchkoski, challenges viewers with a weight management tip of the day. #1412 Good Alignment: By doing exercises with eyes closed, Mary Ann helps viewers build an awareness of how good spinal alignment feels. #1413 New Challenges: Mary Ann introduces a new abdominal exercise called the “Ski Jump” and Gretchen gives you a new balance challenge. #1414 Coordination and Reaction Time: This episode focuses on body awareness and how it contributes to coordination and reaction time. #1415 Lymphatic System: Mary Ann uses soothing music and slow gentle movements to stimulate the lymphatic system. #1416 Mobility and Balance: This episode highlights a variety of exercises to improve balance and concludes with stroking. #1417 Your Feet, Your Foundation: It’s important to let your feet feel the floor. Exercising barefoot, Mary Ann emphasizes somatosensory awareness in the feet throughout the workout. #1418 Flabby Arms: This workout focuses on exercises to tone the arm muscles. Mary Ann introduces a new way to strengthen arms using your own body as resistance. #1419 The Power of Small Movements: This episode demonstrates what can be achieved with small gentle movements. #1420 Flexibility and Range of Motion: All the exercises in this program highlight range of motion throughout the shoulders and back. An exercise band is included with this video. Large Balls, Small Balls and Towels are not included.